We use the latest online security processing, so your order is safe & private. We DO NOT disclose any customer information to ANY third party company. Our customer privacy is our priority. Park Avenue has over 30 years experience buying and selling Rare Coin and Precious Metals. We have the knowledge and ability to provide our customers with the best products and services. DURING THIS DECADE A PATTERN of operations developed which remained standard for decades to come: the Mint's principal output consisted of one denomination in each metal—copper cents, silver half dollars, and gold half eagles. With silver coinage mostly of one denomination, the problem was to multiply dies for striking the millions of half dollars. As with the other denominations, Robert Scot's method was to make working hubs using the copy of the 1795 Gilbert Stuart—John Eckstein portrait of Mrs. Bingham (Ann Willing) as Ms. Liberty, and the heraldic eagle copied from the Great Seal of the United States for reverse. This eagle hub included the arrows (stupidly placed in the dexter claw where they would be interpreted as a primarily warlike national character) and the olive branch, but not the stars. Each working die therefore had to be given considerable hand strengthening, quite aside from addition of the statutory legend; as a result we find from 10 to 13 arrowheads, from 4 to 6 berries, and stars small (1801-03) and large (1803-07). These factors, with corresponding ones for obverse, produced a profusion of interesting varieties: two different overdates 1805/4, that with very wide date (pictured in the Red Book) of great rarity; 1805 with 4 or 5 berries and several different styles of numeral 5; 1806 over 5 knobbed 6 only, 1806 knobbed 6 with 5 or 6 berries, without (extremely rare) or with stem through claw; 1806 pointed 6, without or with stem through claw, with blundered date 1806/9 (actually 6 over inverted 6—the punch was rotated 180 degrees from proper position), or with E of STATES corrected from an erroneous A (also very rare). The earlier dates-1801, 1802—are prohibitively rare in Mint State, the later years through 1807 are very rare in this grade but do sometimes show up at auctions. These coins went into circulation and stayed there, being for long the only silver denomination readily available for change for Spanish dollars, since for some reason Spanish or Mexican four-reales pieces seldom showed up. The date 1804 is not known on genuine half dollars, though some 156,519 were coined and delivered during that calendar year, and though at least two obverse dies were made bearing that date, only to be redated 1805 over 4. Because of the large reported mintage, nobody bothered to have restrikes made at the Mint. Coin dealers usually listed "1804 under 5" where we today refer to "1805 over 4," which may also account for the lack of demand. Nevertheless, the date 1804 was long known to rumor—as far back as 1861. Unfortunately, tracking down many of these rumors led only to examination of 1805/4 halves from which the 5's had been removed, or in one famous instance (pictured in the Newman-Bressett Fantastic 1804 Dollar book) to an 1806 half dollar on which the 6 had been used to manufacture a plain 4 wholly unlike the genuine as found on the 1805/4's. In actuality, the coinage reported for calendar year 1804 almost certainly consisted of coins dated 1803, most of them surely the common variety with large 3 and large reverse stars. Partly the fault of the design, partly of the press used for half dollars and cents in the period (it finally broke down in 1806), many half dollars of this type are very weakly struck in centers though peripheral details are clear enough. Specimens fully sharp in centers are very rare; look at hair in very center, and at eagle's breast feathers just above shield. No credit to the United States, the design of these coins was not long in being scheduled for replacement. When the Mint hired John Reich on April 1, 1807, rescuing him from an indentured servitude which had been little better than slavery, his first assignment was to be to create new designs, hubs, and working dies for the silver and gold coins, and the first denominations he favored were the half dollar and the half eagle. 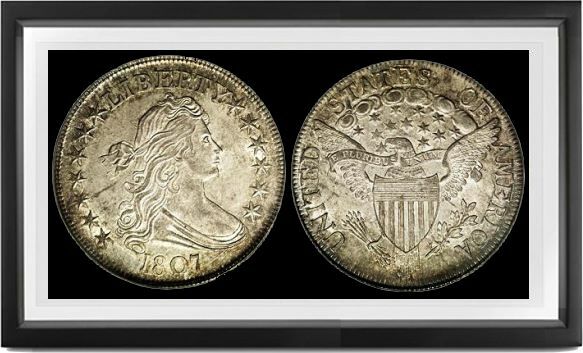 Whether these were actually improvements—other than technically—is still a matter of personal taste; but at least in later years our half dollars were to be better struck than their predecessors. Copyright © 2019 Park Avenue Numismatics. All rights reserved.